Taichung, a city in central Taiwan, has broken ground on a new metropolitan opera house that it hopes will make the region known for its culture. 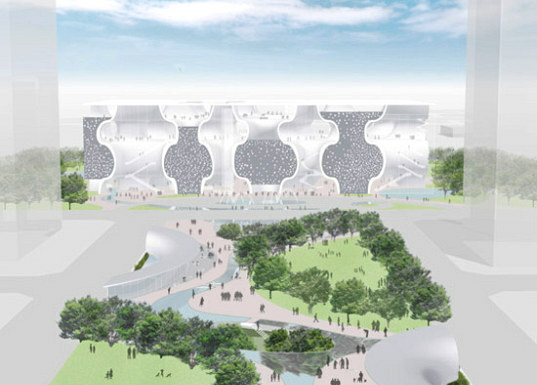 Designed by Toyo Ito, the Taichung Metropolitan Opera began construction in December of 2009 and is expected to open in 2013. Environmental awareness is one of the project’s principle considerations, and the finished project features a curvaceous structure designed to integrate into the surrounding natural landscape. The 800-seat theater will be built using a steel mesh construction with sprayed on concrete in order to create the curvy non-linear walls. Steel bar reinforcements and trusses will be used to create 58 curved walls in what is supposedly the first kind of construction of its kind. The building’s design and form integrate with the surrounding gardens and have complimenting curving shapes that match at the junction between building and landscape. 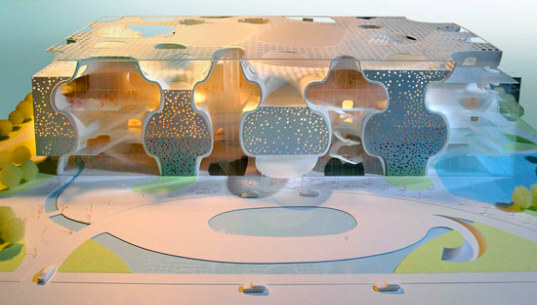 As far as sustainable building elements, Toyo Ito outlines three areas of environmental awareness for his new opera house. First, rainwater from the roof will be collected and used for landscape irrigation and black and greywater will be collected and processed for use in flushing toilets. Second, Ito claims the use of recyclable eco-materials, like steel and concrete, (note – not recycled materials, rather they can be recycled in the event the building is torn down. And lastly, shading techniques, like the use of greenery and landscaping and evaporating water surrounding the building, are utilized to reduce energy use within the building for cooling. Well, they probably shouldn’t claim using “recyclable” materials as a mark of environmental awareness, but we’ll at least give the project marks for strategies one and three. One thing that strikes me about this (aside from the borderline fraudulent 'recyclable' claim) is the statement that this building is "designed to integrate into the surrounding natural landscape." I've seen a lot of bull in modern design, but that might just top it all. The thing is essentially a giant sponge. It is one of the least natural-looking buildings I have ever seen, and the fact that it's curious internal bulges happen to line up with the walkways in the park doesn't make it integrate into the natural environment: it makes it integrate into the human grid of concrete placed upon the natural environment. It is an interesting design, granted, but the BS that these guys are throwing into the air to make it seem environmentally friendly and aesthetically pleasing for it's environment should be recognized as BS and noted as such.